ABC/Image Group LAJason Aldean will be honored as the Artist of the Decade at next month’s ACM Awards in Las Vegas. 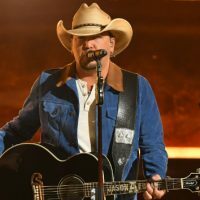 But the three-time, reigning ACM Entertainer of the Year also has an agenda beyond picking up the trophy: He’s also dying to play “Can’t Hide Red,” his new collaboration with Florida Georgia Line from their Can’t Say I Ain’t Country album. The Georgia native says the collaboration came together pretty easily, because he talks to Tyler Hubbard and Brian Kelley all the time. Beyond singing together, the “Rearview Town” hitmaker also enjoys getting the chance to watch his contemporaries in action. Jason himself has recently been in the studio working on his followup to Rearview Town. Stay tuned to see if he and FGL team up to sing “Can’t Hide Red” on the April 7 ACM Awards.